More than 200 pairings are taking part in the three-day event staged on the county’s trio of Ryder Cup courses and Gill and Corker have already put four points between themselves and the rest of the field. Players are competing in three divisions – each named after the course on which they began their pursuit of overall as well as divisional and daily triumphs – and Howley Hall’s James Appleyard and Miles Foster led the way at Moortown with 44pts. Three pairings also came in with 44pts at Lindrick where Fulford’s Cameron Gomersall and Tony Whitaker (Strensall) took first place on countback. Gill and Corker got off to an inauspicious start at Ganton with a one-pointer, but birdied five of the next six holes and had a four-pointer at the 505-yard ninth through Corker’s net eagle. The leaders then birdied the next five holes, as well as the 17th, to match their outward score of 24pts on the inward nine. Appleyard and Foster had three birdies in the first six holes at Moortown, which were supplemented by a gross eagle at the par-5 517-yard seventh from Appleyard. Three further birdies on the way back to the clubhouse gave them halves of 23-21. Gomersal and Whitaker’s tally at Lindrick was founded on a staggering 27pts from the turn that included five birdies and two eagles. 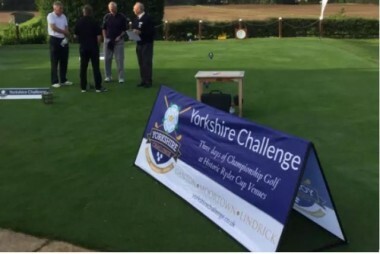 On the final day of the Yorkshire Challenge on Friday, each course will have a nominated hole where anyone holing his tee shot will win £5,000. Lindrick’s Jon Simpkin got his timing wrong when he aced the 169-yard 10th at Ganton on Wednesday, but may take comfort from the fact Ganton’s nominated hole on Fridayis the 159-yard fifth.